Campaigners are confident that it is now when, not if, marijuana is legalised in the US, with several states likely to vote on legalisation initiatives in 2012, and a Presidential election year that increases turn out of liberal voters likely to vote “yes” in California. Where the largest US state leads, others follow, but the ramifications would be global. Mexican and Colombian politicians have said their countries would follow suit, with a snowball effect all but inevitable. "How does one explain to indigenous people that they are not to grow marijuana at the risk of being thrown into jail, but that in the richest state of the United States, they have legalized its production, sale, and consumption?" If the architect of the War on Drugs acted in direct contravention of the UN Conventions underpinning prohibition, the unravelling of the current approach to all drugs could be rapid. But why is legal regulation of marijuana in the California now on the cards, and are the circumstances the same in the UK? Partly it is the bloody reality of the Drug War's failure arriving uniquely on America’s Mexican doorstep. Partly it is a generational shift as older voters are replaced by younger ones who lean towards reform - which is also happening in the UK. But the most important trigger is probably economic. As public spending is slashed to reduce California’s budget deficit, the State Board of Equalisation estimates that legalising and taxing cannabis could raise $1.4 billion dollars, with huge additional savings in reduced enforcement costs. Others have disputed this figure on and the precise number will clearly depend on price controls tax levels and other variables. Regardless, this is an argument that is not going away soon - in the UK as much as the US. As dust from the Comprehensive Spending Review settles, ministers claim no area of public spending will escape scrutiny. Exploring non criminal justice responses to drug users, or more ambitiously, legally regulated drug production and availability, could dramatically improve outcomes for society, make substantial cost savings, and generate tax revenues. Currently, enforcement aimed at reducing supply costs us £380 million per year, but the Home Office estimates the additional cost of ‘dealing with drug related crime’ is £1.7 billion a year, rising to over £4 billion a year, if costs across the criminal justice system (prisons etc.) are included. Yet despite these billions, the Government’s own analysis shows we are further than ever from the promised ‘drug free world’. Drugs are cheaper than ever before, use of the most harmful is at record highs, and massive levels of drug motivated crime is fuelling a crisis in the criminal justice system - at a time when the Government plans to reduce prisoner numbers. Despite this staggering cost ineffectiveness, drug enforcement spending remains protected from public scrutiny within a political bubble of law and order populism. This year alone, reports from the National Audit Office, The Public Accounts Committee and Home Affairs Select Committee have blasted the Home Office for having no meaningful evaluation of the impact of the money spent. In terms of major public spending initiatives, drug policy is unique in this regard. But with widespread concern about public spending cuts, the blank cheque for the drug war may soon be a thing of the past. Crucially, it is now widely accepted that many of the costs of ‘the drug problem’ – including gang violence and acquisitive crime committed by addicts - are primarily fuelled by drug prohibition, not drug use per se. The Home Office does not dispute this, nor does the UN Office on Drugs and Crime, which has acknowledged a ‘vast criminal black market’ is one of the ‘unintended negative consequences’ of the current approach. Yet such is the political fear of more cost-effective approaches, including Portuguese-style decriminalisation or the regulatory models for drug production and supply explored in Transform’s Blueprint for Regulation (with controls over products, vendors, outlets, access and marketing), that they have never been seriously considered. Questions about legal regulation are rebuffed with claims that the benefits would be outweighed by increased health costs from an assumed increase in use. These claims are baseless. The Home Office has never, and will not do, the cost benefit analysis needed to substantiate them. There is also no evidence that prohibition has been an effective deterrent, or reduced drug harms, or that strictly controlled legal availability would increase misuse. When challenged, successive governments have admitted all they have is a ‘belief’ the current system is effective. 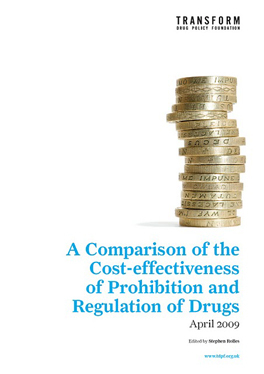 Transform’s analysis, which the Government does not dispute, shows that legally regulating drug supply could save around £2 billion a year from the Home Office budget alone (primarily through a 75% drop in drug motivated crime), with much greater savings to society as a whole. On top of this is the potential to tax cannabis in particular. California’s $1.4 billion marijuana tax take would be from a population only about two thirds that of the UK, whilst in the Netherlands (one quarter of the UK population, with lower levels of use) ‘coffee shop’ tax revenue is 400 million Euros a year, which would rise by 260 million Euros if the supply of cannabis to the coffee shops were taxed as well. The stark reality is that squandering money on the War on Drugs is not just counterproductive, it starves worthwhile projects of funds. If legally regulating drugs realised £2 billion a year in savings and taxes - which is an extremely conservative estimate - it would be equivalent to paying the salaries of 86,000 police constables, or 92,600 teachers, or 94,000 nurses. Alternatively we could refurbish around 250 schools every year and reverse the cut in Child Benefit. Or just fund proven drug treatment and education programmes properly. Whilst this research is based on limited data, it demands that at the very least the Government formally counts the costs and benefits of the current approach, and explores alternatives. No more, in fact, than has been called for by the pre-coalition Lib Dems, and David Cameron when on the Home Affairs Select Committee. When even the US is exploring legal regulation, what is the UK still afraid of? The Government needs to ask; is it really still worth squandering billions a year just to sound tough on drugs? With US support for the legalisation of cannabis/marijuana fast approaching the 50% threshold (California's Prop 19 legalisation ballot measure recently polling the highest ever US support, at 46.1%), and a string of new referendums and Bills coming up in the next couple of years, the debate is moving from if marijuana is legally regulated, to how to regulate it properly. Arguably it was concerns about the legislation in practice rather than priciple that led to Prop 19 falling short. In other words, whilst NFIA remains adamantly opposed to marijuana legalisation, it recognises it is now on the cards, and if it happens, then production and supply should be properly regulated. It is particularly interesting to see the 'imperilled child' narrative - so long used to argue against drug law reform - now being used as the basis for a call for more effective market regulation (based in significant part on lessons learned from mistakes with alcohol and tobacco regulation). Quite right too. Given research shows steadily increasing availability and falling price, and that 80-90% of US 12th graders have easy access to cannabis, (many finding alcohol harder to get), amongst the many benefits of legal regulation of the currently criminal trade, regulation presents an obvious opportunity to protect children and young people. Below are NFIA’s suggestions for how regulation should function, with some added commentary and quotes from the relevant sections of Transform's recent 'Blueprint for Regulation (pdf)', (see in particular the chapter on cannabis regulation, page 110). 1. No Advertising - An advertising ban on legal marijuana. "Links between the advertising and promotion of alcohol and tobacco products, and increased levels of usage of those products, are well established. Such advertising and promotion could easily drive a similar expansion in psychoactive drug usage. Therefore, the default position of any licensing regime should be a complete ban on all advertising, promotion or marketing of all drugs, with any exceptions made only on a cautious case by case basis by the relevant authorities. This ban should include any alcohol and tobacco marketing activities. A default ban should also exist on political donations from any commercial opera­tors in the drugs market. The distinct nature of drug risks relative to most other commodities, and the particular need to protect vulnerable groups from exposure to these risks, justifies this stringent restriction of standard commercial freedoms. These controls should extend to point of sale advertising, and the external appearance and signage for outlets. Such controls should be as strict as possible, within the context of local legal regimes. For example, in the US, a free speech argument can be made against such a ban. However, even though the Supreme Court has extended a degree of ‘free speech’ protection to commercial speech, such speech is still subject to various controls and limitations." Interestingly the NFIA site specifically discusses the free speech point here. In Blueprint there is some additional detailed discussion on how this ban might operate for cannabis specifically on page 114 (see also - point 4 below). 2. A Penalty Fee - on the marijuana industry for every underage user. 3. Automatic Repeal of marijuana legalization if underage marijuana use exceeds certain levels. "This [cautious phased introduction] approach should be, by default, based on a precautionary prin­ciple, particularly where evidence from existing policy is thin, or specific high-risks are identified. New models will thus initially err towards stricter, more intrusive regulation, with lower restriction levels only subsequently coming into play. A precautionary and incremental approach allows for key concerns, such as availability to youth, increase in high risk behaviours or other specific public health concerns, to be closely monitored. If problems do arise, policy can take a step back, be refined and adjusted, and alternative or additional regulatory tools can be deployed." 4. No Product Placements, sponsorships, point-of-purchase marketing, or depictions in entertainment venues. "Cannabis use is embedded in much popular culture. Cannabis products and product iconography are generally non-branded and generic, so a blanket prohibition of anything that might constitute promotion or advertising of cannabis would therefore be impractical. Reasonable controls on exposure to children and young people may be easier to put in place, but would remain difficult to globally define and enforce. However, best practice and evidence from existing controls already widely applied to references to drugs—legal and illegal—in youth media and advertising can be more widely applied. Restrictions could be placed on appearance and signage of venues/outlets. In the Netherlands, coffee shops are not allowed to make external references to cannabis, or use related imagery. Rastafari imagery, a palm leaf image, and the words ‘coffee shop’ have become the default signage. Restrictions could be placed on advertising for certain types of paraphernalia that contain drug references." 5. An Industry-Financed Fund from marijuana profits to pay for the damage legal marijuana will do, so that taxpayers won’t have to pick up the tab. There is a mistaken presumption here that legal marijuana will do more damage, and incur more cost, than illegal marijuana - the tab for which taxpayers already pay - as well as the huge enforcement tab. The industry should be taxed at an appropriate level to balance the potentially conflicting interests of maximising returns, influencing use levels and minimising the illegal markets (see price controls discussion in Blueprint on page 41) .Any tax income (and it is assumed this would be significant given the scale of the market) could support proven public health interventions including treatment, education and prevention, as well as helping to address some of the underlying social drivers of problematic use. 6. A State Agency to Tax and Regulate the marijuana industry, including marijuana purity and potency. "Controls could manage the strength/potency of herbal or resin form cannabis, based on relative proportions of active ingredients (that is, ratio of THC [tetrahydrocannabinol] to CBD [cannabidiol]). Maximum and minimum % content could be specified." 7. Licensed Growers, Distributors, and Retail Sellers Marijuana sold only in licensed retail stores where no other products are sold. "The basic models would involve various forms of licensed sales, for consumption on premises or for take-out—these would be conditional on controls outlined below, and would not preclude a potential pharmacy sales model. A regulated market model (see: page 27) might be an appropriate incremental step as legal supply infrastructure and outlets were established. A key task of any regulatory body would be to manage supply so as to prevent the emergence of branded products and limit all forms of profit driven marketing and promotions." 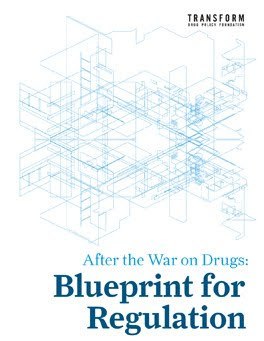 Blueprint also considers how the inevitable small scale growing for personal use could be catered for in a new legal system (p. 214). 8. No Drugged Driving - A ban on driving with marijuana in the systems of drivers or passengers. We agree that no one should drive with levels of any drug in their system sufficient to impair their performance - and, to be fair, no one arguing for reform has ever said different. Just as with alcohol, the detail of what level that is needs setting in law - there is ongoing debate whether it should be zero (it varies between jurisdictions). Technical issues exist with cannabis as, unlike alcohol, it is detectable in the system long after any impairment is evident. Until these issues are resolved it may be that impairment testing (possibly in support of more conventional drug testing) is the most effective response. This is a developing field and should be guided by evidence of what is effective at reducing drug impaired driving and its negative consequences. We disagree with a ban on passengers with drugs in their system, and even the NFIA gives no justification for including them. It might prove impossible to enforce - would the resposibility for drug free passengers be with the driver? What about buses, trains, planes? 9. No Drugged Employees or Students - A ban on people coming to work or school with marijuana in their systems. No one should be going to work or school intoxicated so that it impairs their performance, particularly for safety critical responsibilities, but this should be dealt with consistently for all substances (including alcohol) through existing practices, contracts and agreements. We would caution against over-intrusive testing regimes that do not focus on impairment – which have generally shown to be unjustified and ineffective. 10. Smoke-Free Laws Apply - No marijuana use where tobacco smoking is banned. We agree (see page 61) - although there should usefully be a caveat, detailing different rules for non-smoked cannabis. 2 More Provisions to protect children if Congress legalizes marijuana. 11. Marijuana Controlled by FDA. Marijuana placed under the control of the U.S. Food and Drug Administration, like tobacco is now. We agree. This seems sensible - unless a separate agency is established as suggested in point 6 above. 12. A Surgeon General’s Report on the impact of legal marijuana. We agree, but as part of a much broader ongoing evidence-based evaluative process of all aspects of the approach taken to drugs at the national and international levels. Essentially we agree in whole or part with the majority of the regulatory measures the NFIA is suggesting, many of which could have been taken from Transform's “Blueprint for Regulation”. Whether they have been reading it or not doesn't matter, indeed if they are reaching the same conclusions without reading it that is probably a good sign that when people think sensibly about regulating drugs they will tend to come to similar conclusions. And there are plenty of sensible people advising this campaign initiative. We look forward to genuinely trying to find a common platform that all groups and individuals interested in regulating drugs properly can support in any post-prohibition world. 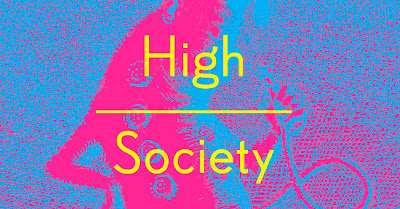 A new, free exhibition (curated by Transform trustee and author Mike Jay) is opening tomorrow at the Wellcome Collection in London and will be running until February the 27th 2011. The exhibition will explore the role of mind-altering drugs in our history. With the illicit drug trade estimated by the UN at $320 billion (£200bn) a year and new drugs constantly appearing on the streets and the internet, it can seem as if we are in the grip of an unprecedented level of addiction. Yet the use of psychoactive drugs is nothing new, and indeed our most familiar ones - alcohol, coffee, tobacco - have all been illegal in the past.